Which pricing method to use? An hourly rate may look more inviting for the client, making it easier for both sides to negotiate. It also offers the feeling of more malleability in terms of payment if compared to a fixed price. A freelancer can decide how much effort to put in a project according to the hourly rate agreed. It is likely to increase productivity, since it requires time tracking and time management, therefore, more organization. Less risk of ending up underpaid if a job takes long. An hourly rate may seem high in comparison with a monthly wage. It can happen that your time tracking and the client’s estimate do not match. That can be solved by previous agreements and arrangements, though. Gives the customer more control over your working process, which may hinder your freedom to work and the client will most likely expect the same excellent result regardless on the limitations imposed to your working time. How can time tracking help: besides making the whole process more agile and the billing much easier, it will provide you with a fair income and the flexibility to organize hourly rates according to what each activity demands. How it works: a price is set from the start. Either agreed with the client or based on a standard price list. You can put a price and just agree with the client on the steps of the projects and stick to it. It is easier to set conditions and establish time frames. More flexibility to create a price list for additional activities, should the customer need some. If you finish faster than expected, you still get the same pay. Clients have a harder time accepting extra expenses, since they understand the price agreed is for you to work for them regardless of the kind of job agreed for the project. At the beginning of a project, the customer has no idea about how much extras can be necessary and how much they will cost unless a time tracking system is agreed on. Negotiations about what is and what is not included in the total price can demand longer negotiations, for which you will most likely not be paid. If it turns out the project was more complicated than you thought at first, you still get the amount agreed with the client. How can time tracking help: tracking your time, with or without hourly rates, will provide you with data, which can help setting prices, and providing more precise time estimates in the future. In addition, it makes it much easier to come up with a report if required. 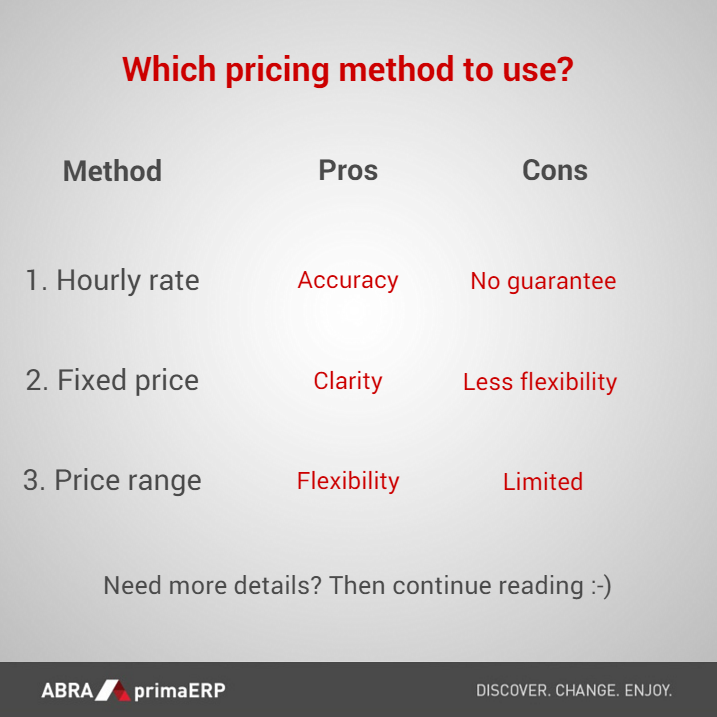 How it works: a price range is set with a minimum and a maximum price for the job. It makes the client feel safe since it provides a boundary over which price will not go. Gives you flexibility to work and staying under the limit makes the client happy. You know the minimum you are supposed to receive. You have room to arrange prices according to the market. Clients may believe you have a price set and the flexibility is just a sales pitch. It makes it complicated to negotiate over the maximum price even if very necessary to meet the client’s request. May require further preparation and negotiation so the possibilities are covered, in case there is a need to go beyond limits. You might have to stay closer to the minimum more often than you found you would at first. How can time tracking help: Tracking time will help you know where in that interval you should place your final price. With a set of hourly rates you create, you can come up with a price you consider fair and adjust it according to clients or the market. Here's a bunch of cool remote spy software for you, guys! Under the Cost Model, the advantage is conveyed at cost less aggregated devaluation and debilitation. do my assignment. Under the Revaluation Model, the advantage is conveyed at a revalued sum, being its reasonable incentive at the date of revaluation less consequent deterioration and impedance, gave that reasonable esteem can be estimated dependably.